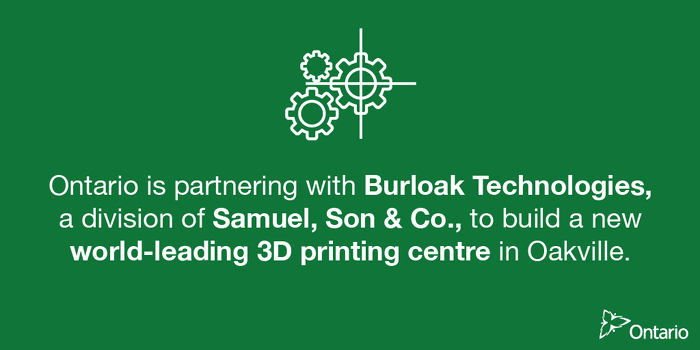 May 4, 2018 2:00 P.M.
Ontario is partnering with Burloak Technologies, a division of Samuel, Son & Co., to build a new world-leading 3D printing centre in Oakville, creating 65 new jobs and retaining 16 positions. Eleanor McMahon, MPP for Burlington, made the announcement on behalf of Steven Del Duca, Minister of Economic Development and Growth, in Burlington today. Burloak Technologies designs and creates 3D metal and plastic parts for a range of industries including aerospace, defense, energy, medical, automotive and transportation. With support from Ontario's Jobs and Prosperity Fund, Burloak Technologies will build a new facility and invest in new technology. This will help the company scale up and reach new markets by developing innovative designs, improving its manufacturing processes and introducing new products. Supporting good jobs and helping businesses grow is part of the government's plan for fairness, and providing care and opportunity during this period of rapid economic change. The plan includes free prescription drugs for everyone under 25, and 65 or over, through the biggest expansion of medicare in a generation, free tuition for hundreds of thousands of students, a higher minimum wage and better working conditions, and free preschool childcare from 2 ½ to kindergarten. The Jobs and Prosperity Fund helps secure private sector investment in Ontario, allowing the government to partner with businesses that are creating jobs and enhancing productivity, innovation and exports. Every dollar invested through the fund leverages an average of $10 in private sector investments. Since January 2013, Ontario has committed over $950 million in projects administered under JPF, leveraging over $12 billion in total investment. This is helping to create and retain approximately 55,000 jobs.